At a very steady rate, unstable carbon-14 gradually decays to carbon-12. The ratio of these carbon isotopes reveals the ages of some of Earth’s oldest inhabitants. 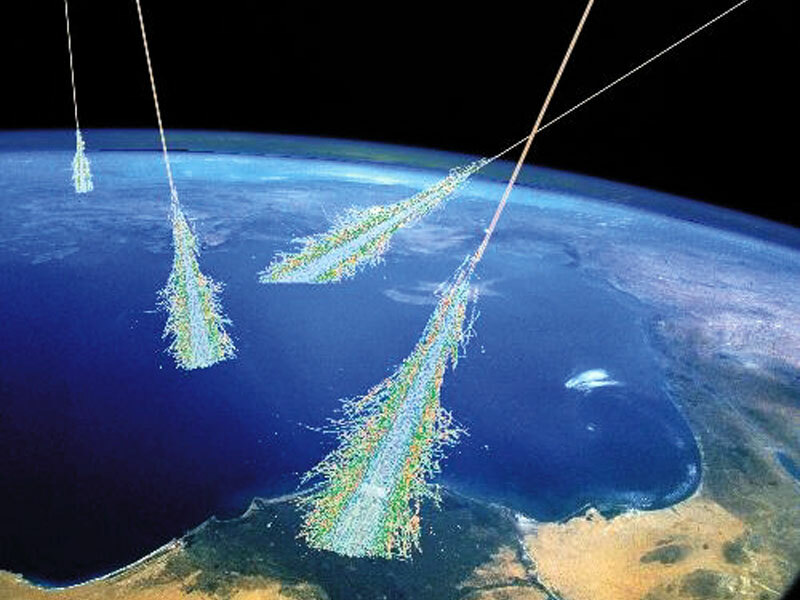 Cosmic rays bombard Earth’s atmosphere, creating the unstable isotope carbon-14. This isotope lets scientists learn the ages of once-living things. Image via Ethan Siegel/Simon Swordy/NASA. Radiocarbon dating is a technique used by scientists to learn the ages of biological specimens – for example, wooden archaeological artifacts or ancient human remains – from the distant past. It can be used on objects as old as about 62,000 years. Here’s how it works. To understand radiocarbon dating, you first have to understand the word isotope. An isotope is what scientists call two or more forms of the same element. If you could peer at the atoms of two different isotopes, you’d find equal numbers of protons but different numbers of neutrons in the atoms’ nucleus or core. Although an element’s number of protons cannot change, the number of neutrons can vary slightly in each atom. Atoms of the same element that have different numbers of neutrons are called isotopes. Here’s an example using the simplest atom, hydrogen. Radiocarbon dating uses isotopes of the element carbon. Image via Mr. Gotney’s 8th grade science class. Radiocarbon dating relies on the carbon isotopes carbon-14 and carbon-12. Scientists are looking for the ratio of those two isotopes in a sample. Most carbon on Earth exists as the very stable isotope carbon-12, with a very small amount as carbon-13. Carbon-14 is an unstable isotope of carbon that will eventually decay at a known rate to become carbon-12. 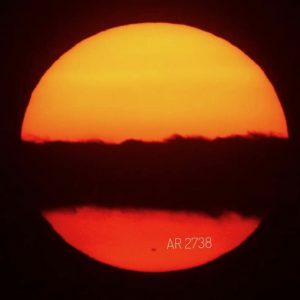 Cosmic rays – high-energy particles from beyond the solar system – bombard Earth’s upper atmosphere continually, in the process creating the unstable carbon-14. Carbon-14 is considered a radioactive isotope of carbon. Because it’s unstable, carbon-14 will eventually decay back to carbon-12 isotopes. Because the cosmic ray bombardment is fairly constant, there’s a near-constant level of carbon-14 to carbon-12 ratio in Earth’s atmosphere. Organisms at the base of the food chain that photosynthesize – for example, plants and algae – use the carbon in Earth’s atmosphere. They have the same ratio of carbon-14 to carbon-12 as the atmosphere, and this same ratio is then carried up the food chain all the way to apex predators, like sharks. But when gas exchange is stopped, be it in a particular part of the body like in deposits in bones and teeth, or when the entire organism dies, the ratio of carbon-14 to carbon-12 begins to decrease. The unstable carbon-14 gradually decays to carbon-12 at a steady rate. And that’s the key to radiocarbon dating. Scientists measure the ratio of carbon isotopes to be able to estimate how far back in time a biological sample was active or alive. 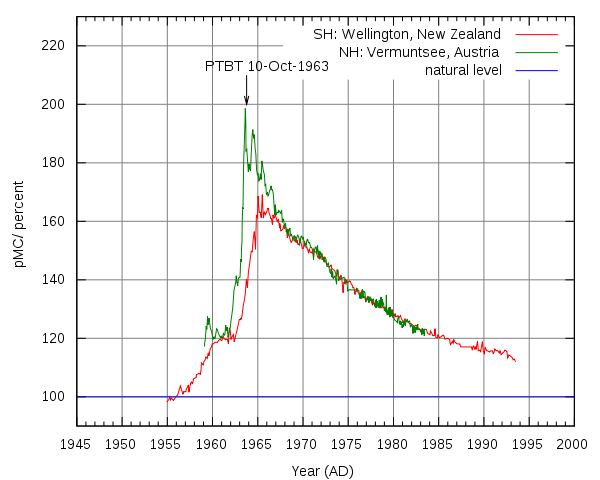 This plot shows the level of carbon-14 in the atmosphere as measured in New Zealand (red) and Austria (green), representing the Southern and Northern Hemispheres, respectively. Aboveground nuclear testing almost doubled the amount of carbon-14 in the atmosphere. That’s why aboveground nuclear testing was banned. The black arrow shows when the Partial Test Ban Treaty was enacted that banned aboveground nuclear tests. Image via Hokanomono via Wikimedia Commons. A special kind of radiocarbon dating: Bomb radiocarbon dating. As we mentioned above, the carbon-14 to carbon-12 ratio in the atmosphere remains nearly constant. 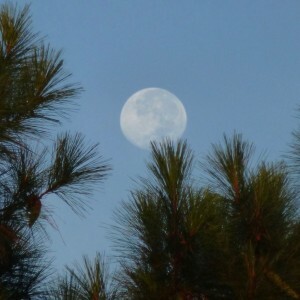 It’s not absolutely constant due to several variables that affect the levels of cosmic rays reaching the atmosphere, such as the fluctuating strength of the Earth’s magnetic field, solar cycles that influence the amount of cosmic rays entering the solar system, climatic changes and human activities. Among the significant events that caused a temporary but significant spike in the atmospheric carbon-14 to carbon-12 ratio were above-ground nuclear test detonations in the two decades following World War II. The only major fluctuation [in carbon-14] we know of occurred when we began detonating nuclear weapons in the open air, back in the mid-20th century. If you ever wondered why nuclear tests are now performed underground, this is why. Most radiocarbon dating today is done using an accelerator mass spectrometer, an instrument that directly counts the numbers of carbon-14 and carbon-12 in a sample.